For some strange reason, I like knowing which public figures are alive and which aren’t. It’s almost a matter of pride. I also like pleasant surprises, of which there seem to be fewer and fewer as time marches on. Learning that Harper Lee was still alive was a pleasant surprise. But there is a point when legitimate pop culture curiosity morphs into something more ghoulish, like the celebrity death pool, which I can say, I’ve never participated in although I’d probably be quite good. Instead, I’m trying to wean myself off of the celebrity death watch racket, but before I do, here’s a rundown of people who you may or may not be surprised to know are still alive. Since the start of 2014, we’ve lost Pete Seeger, Shirley Temple, Mickey Rooney, and Sid Caesar. Still with us are: Doris Day, Harper Lee, and Jake LaMotta. By the way, born the same year as Jake LaMotta is Jackie Stallone, mother of Sylvester and Frank. The Stallones deserve a special place in the pantheon of the long-lived. There is no other family quite like them. Jackie is 92 and Frank Sr. died at 91, living like a champ right up until the end. He loved the ladies, he loved life, he kept himself in vigorous shape, and he sired his last child at the age of 77. Jackie was still giving psychic readings last I heard. Frank Jr. and Sylvester are both in their 60s now, and although Sly doesn’t go off script too much, Frank Jr. loves to banter, and he talks with the swagger of a 21-year old. This family defies age, limitations, and stereotypes. In this era when 50 is the new 29 and 70 is the new 40, these people are legitimate folk heroes. Al Molinaro and Don Pardo are probably the oldest TV people still around. Yes, they’re both older than Abe Vigoda. Carl Reiner, Meathead’s dad, is 92 and was recently spotted at the 2012 Comedy Central roast of spring chicken Joan Rivers. Bob and Dolores Hope lived to 100 and 102 respectively. She passed in 2011. Take that, Montgomery Burns. It might not surprise you to know that “Inside the Actors Studio” personality James Lipton is still alive, but it might surprise you to know he’ll be 88 later this year. How did that happen? Zsa Zsa Gabor, Miss Hungary 1936, is apparently still around, though she hasn’t smacked a cop in 25 years. Did you know she had nine husbands, and one of them was Conrad (Connie) Hilton, who drank with and made Don Draper a star on Mad Men in Season Three? Connie Hilton was of course the great-grandfather of Paris Hilton, which in some weird way makes Zsa Zsa Gabor Paris Hilton’s great-grandmother, right? Zsa Zsa may barely be clinging to life, but she’s still doing better than Paris Hilton’s career. Zing! Kirk Douglas is 97, and the way things are going, he might outlive his son Michael. 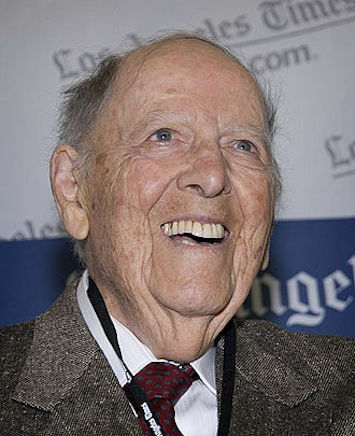 Herman Wouk, who penned The Caine Mutiny about his WWII experiences, which was later adapted into the film that made Bogie a legend, will be 99 in a month. He is the oldest person to grace this list. Right behind him is actor Eli Wallach. Olivia de Havilland is still with us. That’s not a typo. She starred in Gone With the Wind, and alongside Errol Flynn in The Adventures of Robin Hood. Both those movies were made over 75 years ago! Also still here is Maureen O’Hara, whose film career began in 1939 as well, during the Golden Age of Hollywood, when she starred alongside Charles Laughton in The Hunchback of Notre Dame. She made an appearance at the 2013 John Wayne Birthday celebration in Iowa last May. Efrem Zimbalist Jr., who I’ve only ever seen in black and white TV, is still alive at 95. No word on Efrem Zimbalist Sr.
Pete Seeger is gone, but Lawrence Ferlinghetti lives on. At 95, he’s outlived Neal and Jack combined. I. M. Pei is 97. I am surprised. Henry Heimlich, inventor of the eponymous maneuver is 94. His father-in-law was Arthur Murray, the dance studio czar, who lived to 95 himself. The Rev. Billy Graham has ministered to presidents ranging from Harry Truman to Barack Obama, and was particularly close with the White Houses of Dwight Eisenhower and the godfather of this blog, Richard Milhous Nixon. The Reverend will be 96 come November. Most of the Nixon White House staff have gone to their reward, but Henry Kissinger is alive and kicking at 90. So is current Israeli President Shimon Peres. Peres’ first cousin, Lauren Bacall, will be 90 later this year. Jimmy Carter will become a nonagenarian two weeks after Lauren Bacall does. What’s notable about Carter is that two of his siblings died in their early 50s and the third died at 63, all of pancreatic cancer. Pancreatic cancer killed his father at age 58 and afflicted his mother (who lived into her 80s) as well. But the 39th President remains cancer-free. I’ll go ahead and round out this exercise with a mention of Yogi Berra and Joe Garagiola, both of whom are 88. Berra I’ve written about before, and he is a bona fide living American legend. How many people remember that Yogi Bear is named after Yogi Berra and not the other way around? What’s interesting about Berra and Garagiola is that they’re both Italian-Americans, they were born less than a year apart, and grew up on the very same block in St. Louis before going on to have successful careers as starting catchers in Major League Baseball. What are the odds? Surely they deserve mention on this list. Lastly, at the start of 2014, there were five verified living people who were born in the 1800s. By the end of the year, there is a good likelihood they will all be gone. And with that grim tally, I’m done with this racket where there are no winners. I now choose life, or what’s left of it.